South Pacific Whitetail deer are very secretive and elusive, free range trophies are hard to obtain. Whitetail deer hunting in New Zealand is the complete opposite of hunting whitetail deer in North America. 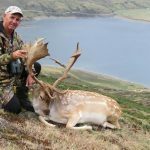 South Pacific whitetail deer numbers are extremely low and due to hunting pressure and a raft of other factors South Pacific whitetail have adapted basically into an alpine animal and live on the valley slopes rather than the valley floor. A free range South Pacific whitetail is a trophy sought after by many international hunters and is one of the hardest trophies to obtain in New Zealand. 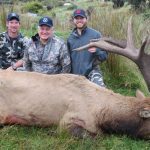 Our record for free range whitetail bucks is unsurpassed by any other outfitter in New Zealand. Free range whitetail hunts are an 8 day backpack hunt in alpine terrain, with an option to add a chamois. This is the only place in the world where a whitetail and chamois can be hunted in combination. Success rates are 50% on a whitetail buck of 8 points or more, this is a tough wilderness hunt, good fitness is essential, hunting is mainly done from spike camps. Free range South Pacific whitetail deer trophies are becoming harder and harder to find. Currently we are working on free range private access for whitetail deer hunting; we have a number of hunters in constant contact with us asking about developments… we will keep you updated. We also have access to whitetail deer on a game estate where success rates are obviously a lot higher. Bucks of 10 points are not uncommon on the estate. Whitetail bucks strip their antlers in late February at this time younger bucks are still in their summer coat, mature bucks still have their faces in summer coat but their bodies are starting to change to winter grey and by the end of March mature bucks are in winter coat. Whitetail bucks shed their antlers in August / September.